Miami entered 2017-18 with just three seniors, but its 2018-19 roster features 10 first-year RedHawks. One is an NHL draftee – Johnny Gruden was selected by the Ottawa Senators in the fourth round last month. Of the 10, five are forwards, four are defensemen plus one goalie. That brings Miami’s full roster to 15 wings and centers, nine blueliners and three netminders. Two key names were missing from the RedHawks’ roster: Fs Matej Pekar and Ryan Savage. Pekar was committed to UNO but switched to Miami this spring, following assistant coach Peter Mannino. He was drafted one spot ahead of Gruden, No. 94, by the Buffalo Sabres. Since this is a sensitive subject that could negatively affect Pekar, BoB will not report any speculation about if or when he will join the team. Savage, son of former NHL forward and RedHawks standout Brian Savage, signed an NLI prior to 2017-18 but will play another season in juniors after going 8-7-15 in 48 USHL games. He will join the RedHawks in 2019-20. 2017-18 stats/team: USNDT, 61 GP, 28-32-60. Notes: Gruden has the best credentials of any incoming player. He was drafted by Ottawa 95th overall in June and kept a point-a-game place for the USNDT and posted 15 goals and 19 assists in 25 games vs. USHL opponents. His father, John Gruden, is a former NHL defenseman who logged 92 games over parts of six seasons with Boston, Ottawa and Washington. He is now the coach of OHL Hamilton, which makes Jonathan Gruden choosing the college path interesting. In addition to his points production, he has impressed with his two-way play, and he also can play multiple forward positions. Coach Enrico Blasi really likes versatility. Where he fits in this season: There’s rarely a sure thing in college hockey, but barring injury Gruden will almost certainly skate on one of the top two pairings this season and should excel. The RedHawks will need his offensive talents, as six forwards from 2017-18 have moved on. 2017-18 stats/team: Muskegon (USHL), 57 GP, 10-15-25. Notes: The former Boston College commit (actually still on the Eagles’ 2018-19 roster!) is the cousin of former NHLer Tony Amonte and current Minnesota Wild center Charlie Coyle. Graham has already played three full seasons in the USHL, logging 173 games and notching 21 goals and 36 assists. He is known for his skating, and he racked up 95 PIMs last season. While he went from eight points to 24 in his first two USHL seasons, he climbed just one point to 25 in 2017-18. Where he fits in this season: Not a big offensive guy in juniors, but Graham reached the 10-goal mark for the first time last season, so he may slide into a starting role. Miami only has nine returning forwards, so opportunities for ice time should be ample for rookies up front. 2017-18 stats/team: North York (OJHL), 47 GP, 18-20-38. Notes: Jordan played four seasons for St. Michael’s of the Ontario Junior Hockey League then was back in that league for his overage season in 2017-18. He netted 18 goals and dished for 20 assists in 47 games with North York and also tied for the team lead in playoff points with 12 in 11 games. Jordan is 21, and only 20 Division I players are taller, according to College Hockey News. Originally a Quinnipiac commit, Jordan switched to Miami in April. Where he fits in this season: The OJHL is considered a slight step above the NAHL, so we’ll see how that offensive success translates in the NCAA. With Conor Lemirande graduating, a player exhibiting a similar style could be welcome for the RedHawks. 2017-18 stats/team: Tri-City (USHL), 58 GP, 6-10-16. Notes: Hawkinson has played the past three seasons with USHL Tri-City, where he was team captain last season. He was also teammates with Graham the duo’s first two juniors campaigns. Known as a do-anything-to-win type, he enters 2018-19 with 164 games of regular-season experience in the USHL. He notched just 10 points in his first two seasons combined in that league, but he stepped up with a 6-10-16 line last year. Tri-City lists him at 5-10, 175 while other sites have him at 5-9-146. Where he fits in this season: Hard to say because smaller forwards are usually known for their offense and Hawkinson is more of a grit guy. A ton of USHL experience should make for a smooth transition to the college game. 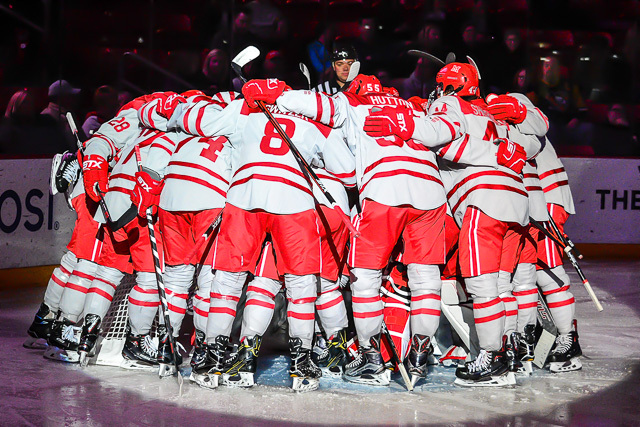 2017-18 stats/team: Dubuque (USHL), 59 GP, 6-18-24. Notes: Another older player with ample USHL experience, Corbett started his Major Juniors career in the NAHL but has been in the U the past season and a half. The dual citizen committed to Miami last week, becoming the third player from the northern Indianapolis suburb to join the RedHawks in the past dozen years, with Cameron Schilling and Grant Hutton being the others. Corbett was solid in his first full season in the USHL, going 6-18-24 in 59 games with Dubuque. He has good size for a forward competing in the ultra-physical NCHC. Where he fits in this season: He hasn’t been a big points producer in juniors but Miami hasn’t gotten much production from its third and fourth lines in recent seasons so he may have the opportunity to thrive. Again, with nine returning forwards, starting slots will be there for the taking so Corbett and the four other newbies up front should get long looks this fall. 2017-18 stats/team: Chicago (USHL), 56 GP, 8-21-29. Notes: Peter Mannino was Daschke’s coach for Clark Cup-winning Chicago of the USHL this spring. Daschke was committed to Nebraska-Omaha, where Mannino was an assistant, but when Mannino was hired by Miami this off-season, the blueliner switched his commitment to the RedHawks. His commitment is definitely in the top five news items from this program this off-season. Daschke has played in the USHL since 2014 and he was the captain of that championship Steel team last season. He has a laser of a shot and found the net eight times last season, adding 21 assists. Where he fits in this season: It’s hard to imagine, barring injury, Daschke not contributing right away. He’s big, he’s experienced, he can shoot the puck and he’s joining a team that has just five returning D-men. 2017-18 stats/team: Aberdeen (NAHL), 58 GP, 0-19-19. Notes: Sinard is a shut-down defenseman with a huge reach, and he also picked up 19 assists last season with NAHL Aberdeen. He started his Major Juniors career with USHL Cedar Rapids but has been with the Wings since. Sinard does not have a goal in 96 juniors games, but he has impressed with his shut-down prowess. Where he fits in this season: The only two similar players in recent Miami history are Brian Sipotz and Michael Findorff, and neither were full-time starters, although Sipotz played six seasons with Chicago of the AHL. We’ll see if Sinard can buck that trend. 2017-18 stats/team: Muskegon (USHL), 55 GP, 5-14-19. Notes: Like Daschke, Crowder was also committed to Nebraska-Omaha but switched to Miami after Mannino was brought in as an assistant. Crowder left Canada two seasons ago, and after staying in the NAHL in 2016-17, he jumped to the USHL and went 5-14-19 with Muskegon, finishing plus-11. Miami will be his 10th team in six seasons, so the blueliner should welcome the stability. His father, Troy, was a tough guy who logged 150 NHL games over seven seasons, amassing 433 PIMs to go along with his nine goals and seven assists. Where he fits in this season: A 6-6 defenseman who scores five goals in the USHL is very intriguing, especially since he was 18 when last season started, and big guys typically develop later. 2017-18 stats/team: Dartmouth (NCAA), 28 GP, 1-2-3. Notes: Like former Miamian Marc Hagel, Rymsha completed his degree with a year of eligibility remaining due to an injury that cost him the majority of a season, so he will work on his graduate studies at Miami. Rymsha, who will not turn 22 until next month, played just 63 games at Dartmouth and scored three goals accompanied by five assists. He is known as a physical D-man with a high hockey IQ. Rymsha also boasts a strong hockey pedigree, as his father, Andy, played six games with Quebec of the NHL and his brother is a Los Angeles Kings prospect. Where he fits in this season: He has not played more than 28 games in an NCAA season and has just eight points, so it’s unlikely he goes Grant Hutton this season. But another steady blueliner with plenty of college experience can’t hurt on a team that will start the season with five D-men who are freshmen or sophomores. 2017-18 stats/team: Alabama-Huntsville (NCAA), 32 GP, 12-18-2, 3.05, .907. Notes: Another fifth-year senior situation, as Uhelski was a major contributor in net for Alabama-Huntsville the past two seasons. He played 55 games with the Chargers the past two seasons, posting a .907 save percentage and recording 18 wins. Where he fits in this season: Chase Munroe and Grant Valentine were expected to vie for the backup job this season, but Munroe is not listed on Miami’s roster and Uhelski is. Boasting a quality resume, Uhelski could move into the No. 2 spot and push Larkin for starts. Posted on July 19, 2018, in 2018-19, Recruiting, Uncategorized and tagged 2018-19 miami redhawks, andrew sinard, brayden crowder, brian hawkinson, derek daschke, jonathan gruden, jordan uhelski, matej pekar, miami recruiting, monte graham, noah jordan, river rymsha, ryan savage, scott corbett. Bookmark the permalink. Leave a comment.